40% Off Holiday Sale is on! 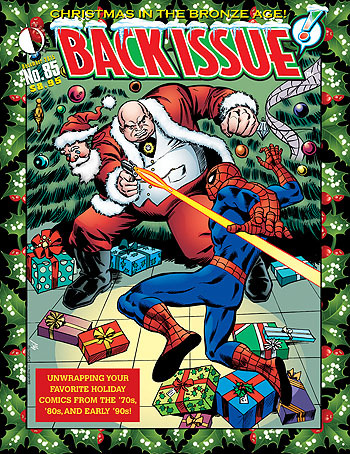 So make your season bright with the industry’s best comics-related publications! The sale applies to everything except our newest and upcoming releases, subscriptions, digital editions, and bundles. (But those still have our everyday discounts applied.) And it ends on December 1. Thanks for another great year, and have a wonderful holiday season! This entry was posted in TNT on 13 November 2015 by Mr. Morrow. The TwoMorrows crossover starts today! 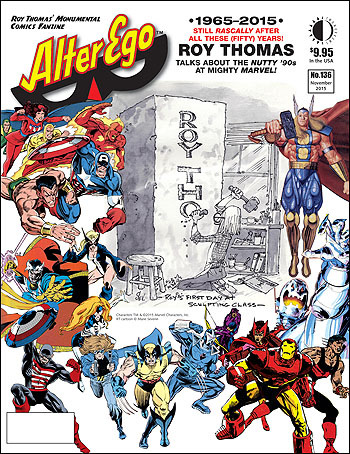 Today, we’re shipping both Alter Ego #136 (a bonus-size $9.95 issue), and Back Issue #85. But astute fans who have seen it are already asking: What in the world is going on with the last two-page spread in each issue? It’s the start of a top secret, all-encompassing TwoMorrows Crossover that we’ve been planning with all our magazine editors for several months. Each of our November-December releases (even BrickJournal, our LEGO magazine) features a special two-page spread, and they all interconnect to form one massive image, showcasing the efforts of nearly 100 of the comics industry’s top talents! And the final, big reveal will be in Alter Ego #137 (shipping in December). So as they say, “collect ’em all,” join them together, and enjoy! This entry was posted in TNT on 11 November 2015 by Mr. Morrow.